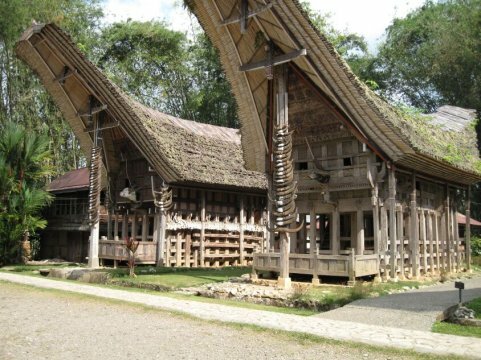 The people of Tanah Toraja had no direct contact with the west until the twentieth century, when the Dutch gained control of this region. Toraja means ‘men of the mountains’ ; the people lived in isolation in their mountain homes for centuries. Islam never reached the Toraja. 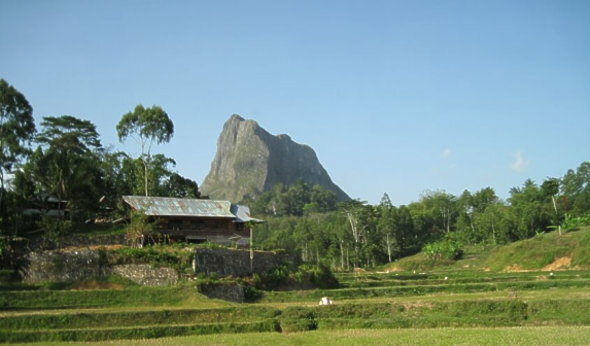 The best known Toraja are those in the southern region, the Sa’dan Toraja. Until the early 1900’s when the Dutch mastered the Toraja and Christianized them, there were still headhunters among the Toraja. Their animist culture is one of many ceremonies, including the best known, those centered on the buffalo. This animal plays an important role in Toraja life; it is a status symbol and also a sacrificial symbol slaughtered during religious ceremonies such as funerals. For the consecration of a new ‘Tongkonan’ or traditional house, large numbers of buffaloes might be slaughtered. Expensive Tongkonan houses are still built and used in the traditional ways. Another Tanah Toraja attraction is the ‘Tao Tao,’ hanging cliff graves that are cut from the rocks as a way to prevent the common crime of grave plundering. Although most Toraja are now Christian (thanks to Dutch missionaries) their animist traditions continue to infuse their culture.